On August 17, NASA's Cassini spacecraft made its final close flyby of Dione, one of Saturn's fascinating moons, sending us the highest-resolution pictures of its surface to date. And though this isn't the last flyby of a moon in store for Cassini, the event marks the beginning of this flagship mission's end game. On this fifth and final flyby of Dione, Cassini passed within 295 miles of the moon's surface — a bit higher than the International Space Station orbits the Earth (keeping in mind, though, that Dione is only about 660 miles across). Though Cassini accomplished some exquisite photography, the primary objective of this pass was to probe Dione's gravity, magnetic field, and the plasma environment around it. Analysis of these data will allow scientists to probe the moon's interior structure. Similar measurements of two of Saturn's other moons, Titan and Enceladus, were responsible for the discovery of liquid seas deep beneath their crusts. 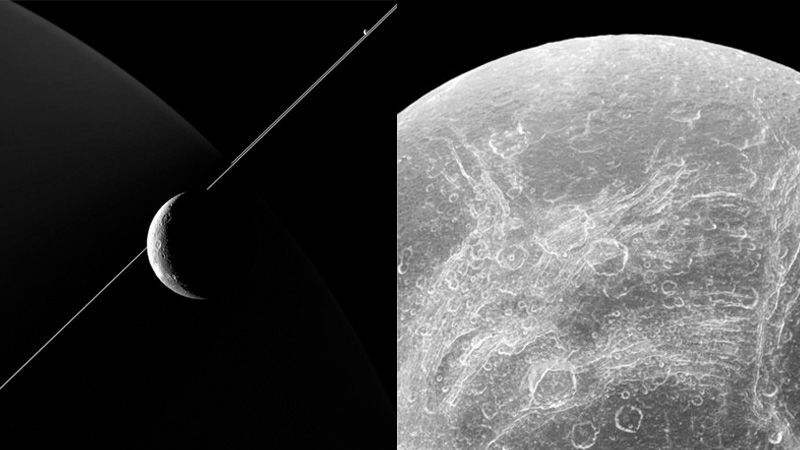 It's too early to tell what this flyby will reveal about the realm beneath Dione's surface, but if there's one thing we have learned from Cassini about the moons of Saturn, they tend to be full of surprises. In the months ahead, Cassini will buzz other Saturnian moons, including three passages of Enceladus, one at a distance of only 30 miles from its surface. 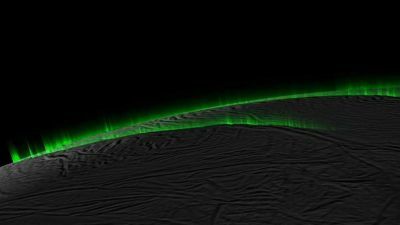 This moon-raking graze will send Cassini deeper than ever before into Enceladus' plumes of water vapor, which spew from under the moon's crust. 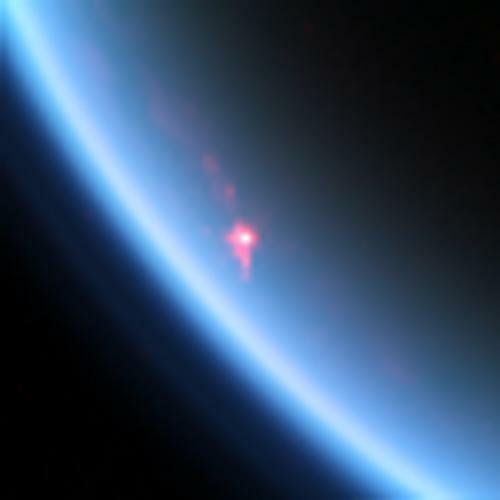 That encounter could reveal more eye-opening clues about the moon's subsurface geyser chambers, sea, and possible hydrothermal vent activity at the sea floor — all of which have been detected previously. Cassini's 11-plus-year mission has been a stunning success in terms of its exploration and close scrutiny of Saturn, its system of ice and dust particle rings, and its entourage of moons. Early in the mission, in 2005, Cassini launched the European Space Agency's (ESA) Huygens probe onto the surface of Saturn's largest moon, Titan, making it the only solid surface in the outer solar system on which we've landed a spacecraft. 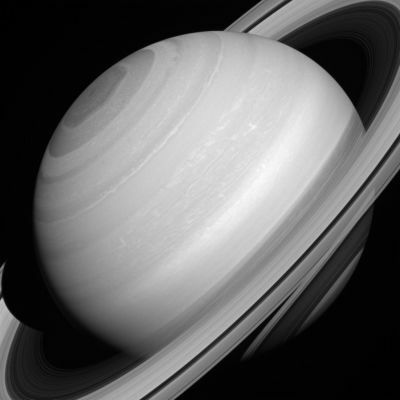 Over the last decade Cassini, and the Huygens probe, have greatly illuminated the Saturn system -- but the mission did not begin without some controversy. The 1997 launch of this spacecraft, which carries 73 pounds of plutonium within three radioisotope thermoelectric generators (RTGs), was met with strong opposition. Protesters were concerned with the possibility that a launch accident could spread the radioactive material into the Earth's environment and pose health risks to human and animal populations. Exploration of the outer solar system, particularly as far from the sun as Saturn, requires a source of power other than sunlight, since sunlight at that distance is too weak for solar panels to be a practical alternative. Heat from the radioactive decay of substances like plutonium offers a steady and long-lasting supply of energy with which to generate electricity. The New Horizons spacecraft, which recently made its close flyby of Pluto, is powered by one of the Cassini mission's spare plutonium-238 RTGs. After next December, Cassini will make only a small number of distant flybys of Saturn's larger icy moons, and after that a series of long-range encounters with some of Saturn's tiny, irregular moons, which we haven't seen in any great detail so far. Then in 2017, Cassini will enter what is being called its grand finale, steered into an inclined orbit that will send it repeatedly between Saturn and its innermost rings, a region that no spacecraft has ever before explored. With the mission refocused exclusively on close-up investigation of Saturn and its rings, this daring and somewhat risky maneuver will deliver details about the gas giant planet as never before. Cassini will probe the interior of Saturn through its magnetic field, take extreme high-resolution images of its cloud systems, and obtain much better measurements of the mass of its ring system, which could give scientists great insight into its origin. In the meantime, our adventure in the Saturn system isn't over yet, and we can expect more amazing revelations over the next year or two.